Trombone Kazoo as seen on Boston Legal!!!! Vintage kazoos. Made in the USA. These whimsical designs are completely playable and have been revived exclusively for us by the same antique factory that made them over 60 years ago! Vintage Kazoos are constructed of metal with plastic mouth pieces. The trombone side actually moves for effect!! 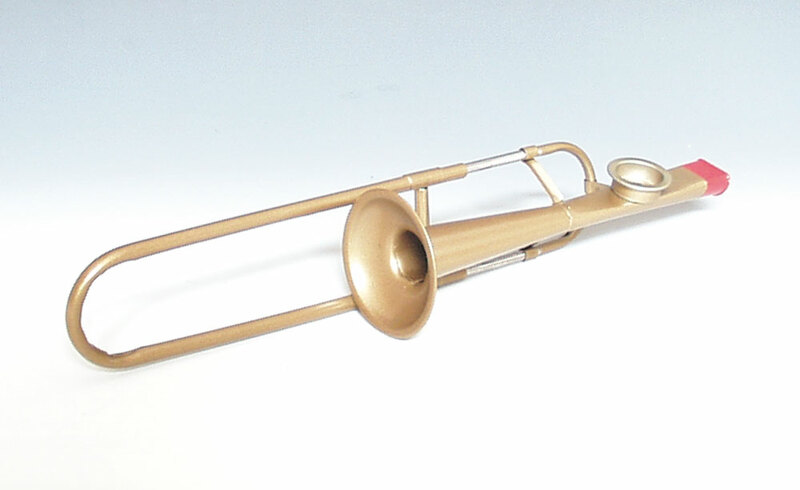 The instrument tone is not influenensed by the slide position.11"L.
The trombone is available in Bronze/Gold coated finish. A kazoo player hums, rather than blows, into the instrument. The oscillating air pressure of the hum makes the kazoos membrane vibrate.The resulting sound varies in pitch and loudness with the players humming. Players can produce different sounds by singing specific syllables such as doo, who, rrrrr or brrrr into the kazoo. KH This was for my daughter's 19th birthday. She played trombone for 8 years in school. I think it was her favorite present, and she got some big ones! She's a kid at heart and happily played it through the evening.